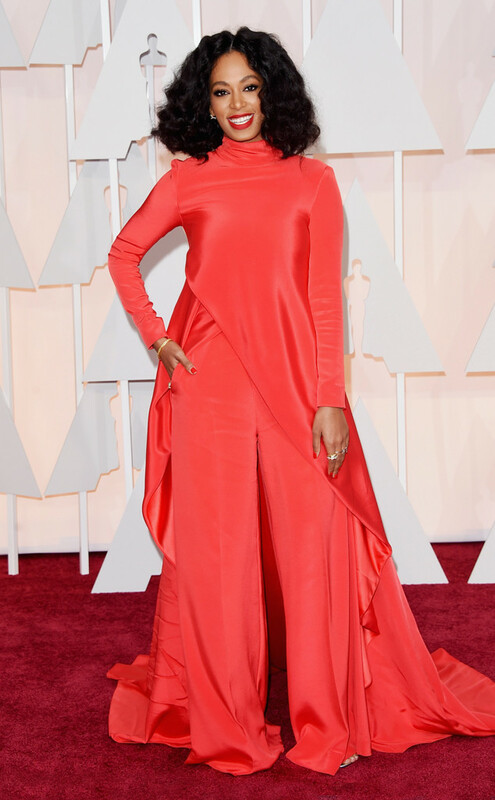 Home My Worst Dressed 2015 Oscar Picks: That’s Just Wrong! This was the biggest bounty of bad fashion and half-assessed, boring choices, evah, on an Oscars red carpet. Here are my Worst-Dressed Oscar picks. (1) Lorelei Linklater, the 20-year old actress from the film “Boyhood,” should fire her stylist for choosing the worst dress that designer Gabriela Cadena has ever created. Cherry blossom panels look like wallpaper from a Chinese restaurant, used maybe because she ran out of black fabric? The skirt is too tight, ill-fitting, the slit is too high and the makeup is too harsh and dark for her age. All of this is tragic because she’s so cute. Maybe she should hire a stylist? 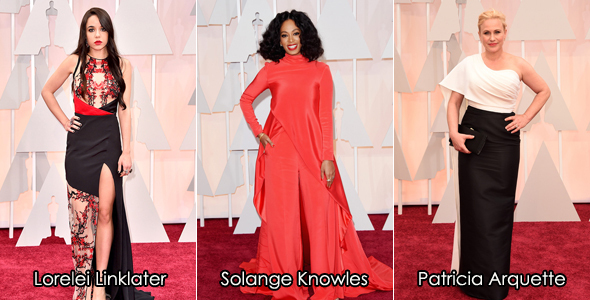 (2) Solange Knowles really stood out on the red carpet, but not in a good way. You couldn’t ignore the traffic-cone orange, pajama pant-tunic combo disaster by Christian Siriano. Did she get tangled up in a tarp when her house was being tented for termites but was in such a rush she just kept going? Muy sad, because I love Siriano. (3) Best Supporting Actress winner Patricia Arquette was dressed by her best childhood friend, designer, Rosetta Getty. With friends like these who needs enemies? Getty violated crucial laws of figure camouflage. A two-color dress visually cuts an already short figure into two shorter ‘pieces.’ A high, strapless neckline made from stiff, horizontally-gathered fabric makes a big bosom look bulkier. That wasn’t bad enough so Getty extended the fabric horizontally across one arm, making it look shorter. This entire look, including hair that looked like Arquette just got off a speed boat, was a screaming mess.